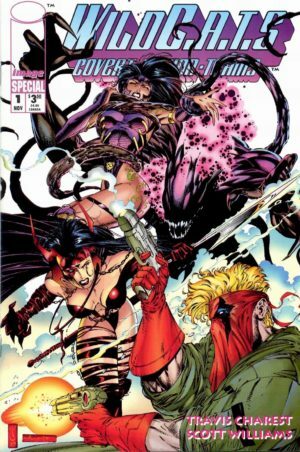 [Patreon-Nov16-Post-Bug][/Patreon-Nov16-Post-Bug]After WildC.A.T.s managed to wrap up its intended three-issue mini-series in four issues and 10 months it was unclear what the more permanent version of the title would be. In the gap, WildStorm quickly thrust WildCATs Trilogy, a three-issue mini-series from newly-poached Marvel young gun Jae Lee. It took just six months to complete (that’s sarcasm, by the way), and was accompanied by a single-issue Special #1 from Lee’s remarkable feel-alike protegé Travis Charest (which explicitly states that it fits prior to Trilogy). Both arrived in time to promote the continuation of the WildCATs mini-series to a full-time ongoing with #5 in fall of 1993. Both also wisely put a heavy focus on Grifter, Voodoo, and Zealot, quickly realizing that the rest of the team is a snoozefest. The Special issue is an outstanding adventure that proves that the book, its concept, and its cast will have many stories to tell thanks to Voodoo’s status as the only proven Daemonite detector on Earth. Marvel vet Steve Gerber – the co-creator of Howard the Duck! – shows a deftness with set-up scenes that makes the long, slow build-up of this issue as interesting as the brief burst of action that ends it. On art, Charest does Jim Lee as well (maybe sometimes better?) than Lee, especially with an assist from Lee’s habitual inker Scott Williams. Trilogy has its gawky moments of art from Jae Lee, who was still a teenager without much experience. Its strength is as an early shot of origin for the magnetic Zealot. Serving that here was a wise choice, as her popularity and narrative power would go on to threaten the team balance of the main book. Spending so much time explaining the Coda in the ongoing title would tip the scales a bit too far away from the rest of the team, but it feels just right in a mini-series. Want the play-by-play? Keep reading for a summary of this introductory story. Here’s the schedule for the rest of this month’s WildStorm re-read – tomorrow I tackle Stormwatch #4-5 & Special #1.